People wonder what has been happening recently, with wildly gyrating financial markets and government debt problems. It seems to me that we are bumping up against an economic growth ceiling, brought on by a limited supply of cheap oil. As a result, we appear to be headed back into recession. Debt deleveraging can be expected to play an important role as well, and may cause this recession to be much worse than the last one. Economists tend to believe that economic growth can continue, essentially forever. We are now reaching a reality check, with the recent severe recession and the economy’s apparent inability to rebound from that recession. There are many reasons to believe that at least part of our continuing recessionary problem has to do with oil prices. For one thing, we know that food prices tend to rise with oil prices (Figure 1), and that food is a major expenditure for much of the world’s population. 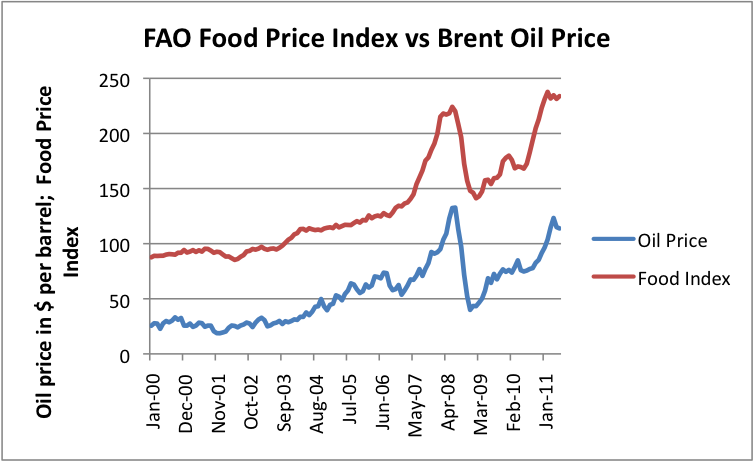 The association between oil prices and food prices arises partly because oil is used to grow and transport food. Now that food is being used to produce biofuels, there is a connection in the opposite direction as well: high demand for oil tends to lead to high demand for food crops that substitute for oil, thus further acting to raise food prices. Another connection between oil prices and recession comes from looking at the historical record. James Hamilton has shown that 10 out of the last 11 US recessions were associated with spikes in oil prices. We also know, based on logic, that recession is likely to arise from a spike in oil prices. This happens because people’s salaries generally don’t rise when oil prices rise and, as mentioned previously, food prices tend to rise at the same time as oil prices. Since food and commuting expenses are necessities, workers tend to cut back on discretionary spending when oil prices rise. Businesses are affected by cuts in discretionary spending and lay off workers. Those former workers also cut back on spending, and some former-workers default on loans. The result is a recession. It is logical to expect that at some point, oil prices would become more expensive, even after inflation adjustment. We live in a finite world. We extract the easy (and cheap) to obtain oil first. At some point, we can expect this easy-to-obtain oil to run short. When this happens, we are faced with extracting increasingly expensive oil. We seem to be reaching this point now. What happens when there is a shortage of cheap oil? Economists tell us that with oil, we should expect that either (1) or (2) will resolve the shortage situation. In fact, we know that in “real time,” this is not happening. Oil prices gyrate wildly, but remain far above levels of the early 2000s. Even broadly defined oil supply (including natural gas liquids, biofuels, coal-to-liquid, and gas-to-liquid) is not, in practice, adding enough to world fuel supply to keep prices down (Figure 2, below). 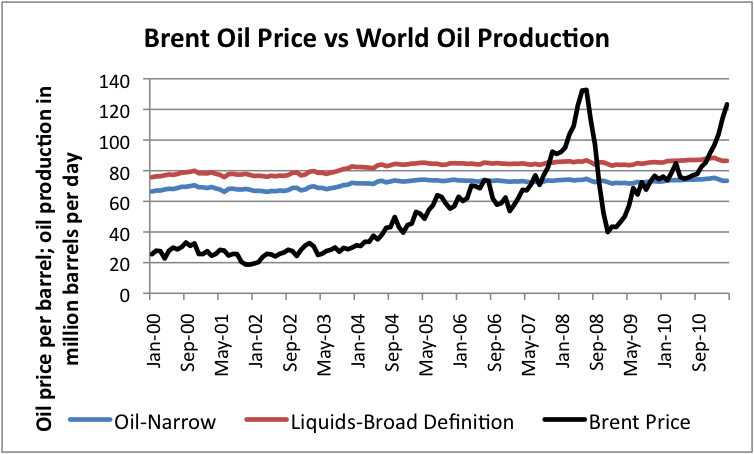 This occurs because world oil production, however defined, is close to flat, regardless of price. At the same time, demand from China, India, and countries that export oil, like Saudi Arabia, is increasing rapidly. Figure 2. World oil production in million barrels per day, versus Brent oil price, based on EIA data. It seems to me that what really happens in the case of a shortage of inexpensive oil is much closer to Option 3 – “Shortage not eliminated; smaller quantity of the end product produced.” In this case, “inexpensive oil” is the necessary ingredient, and the “world economy” is the product produced. Nitrogen Fertilizer Example. What happens with growing crops is that the yield is reduced, if there is a shortage of an essential nutrient. Thus, lower nitrogen availability would tend to lead to less corn yield per acre. This situation is well-known, and has a name attached to it–Liebig’s Law of the Minimum. It states that growth is controlled not by the total amount of resources available, but by the scarcest resource (limiting factor). Flour for Recipe Example. What happens in baking is very similar to the Liebig’s Law of the Minimum. If a baker discovers that he has only three cups of flour, and a chocolate chip cookie recipe calls for four, he finds a need to make a smaller batch. The smaller batch uses fewer eggs, less shortening, and less chocolate chips. So if the baker was planning to use a full package of chocolate chips, for example, he finds he has some left over. It seems to me that the world economy operates on a similar basis. It doesn’t care about our good intentions for substitutes some time in the future. It cares about what is available at prices that customers can afford, now. Thus, the issue is more one of a shortage of cheap oil, than it is one of a shortage of oil in general. As an example of how high-priced oil can lead to cutbacks in employment, suppose the price of asphalt is too high for a state to repave the same number of miles as in the past. The state may choose to repave fewer miles. The workers who would previously have laid the additional asphalt end up out of work. As another example, customers are faced with high oil prices for commuting as well as high food prices, and as a result, cut back in going out to restaurants. If their cutbacks lead to the lay off of restaurant workers, this is another example of high oil prices leading to reduced employment. Thus, high oil prices tend to lead to economic contraction affecting other variables of the economy, such as employment. We can think of this economic contraction at high oil prices providing a ceiling on economic growth. When we hit this ceiling, the economy tends to bounce back downward, until equilibrium is again reached. When the oil price spike of 2008 hit, governments responded with increased spending. This increase in spending mitigated the immediate crisis, but in practice, moved quite a few of the oil-induced problems from the private sector to the governmental sector. Figure 3. 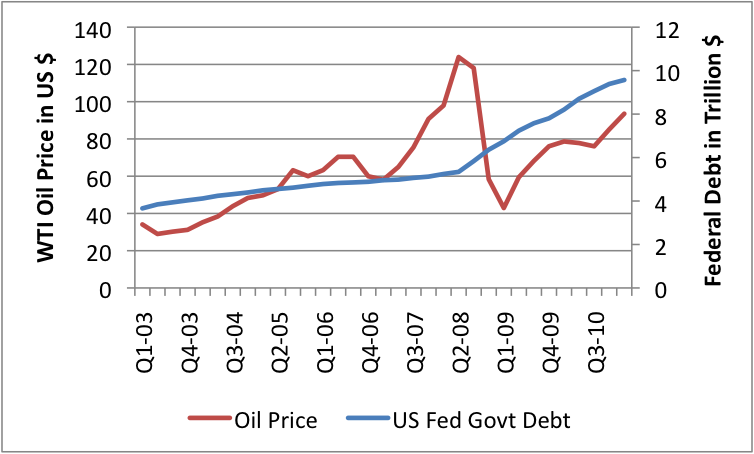 Average quarterly oil price and US Federal External Debt, based on EIA and Federal Reserve data. 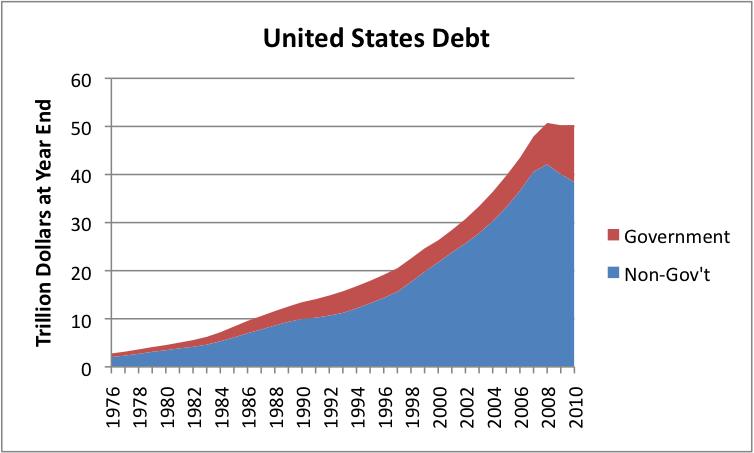 At the time oil prices hit their peak and started declining in mid-2008, US government debt levels began rising rapidly (Figure 3), because of higher “entitlement” spending and stimulus payments. As a result of this increased spending in 2008-2011, governments are now finding themselves dealing with debt downgrades, fights over debt limits, and a need for raising taxes or cutting benefits. We don’t think about it, but economic growth is important in the ability of borrowers to repay debt with interest. Because of this relationship, if we hit a ceiling on economic growth for any reason, debt deleveraging is likely to quickly become a problem. If the future is better than to day, it makes sense to borrow, even if the borrower has to repay the loan with interest. Investment opportunities are likely to look good, and even with interest, debt repayment is likely not to be a problem (Figure 4, Scenario 1). 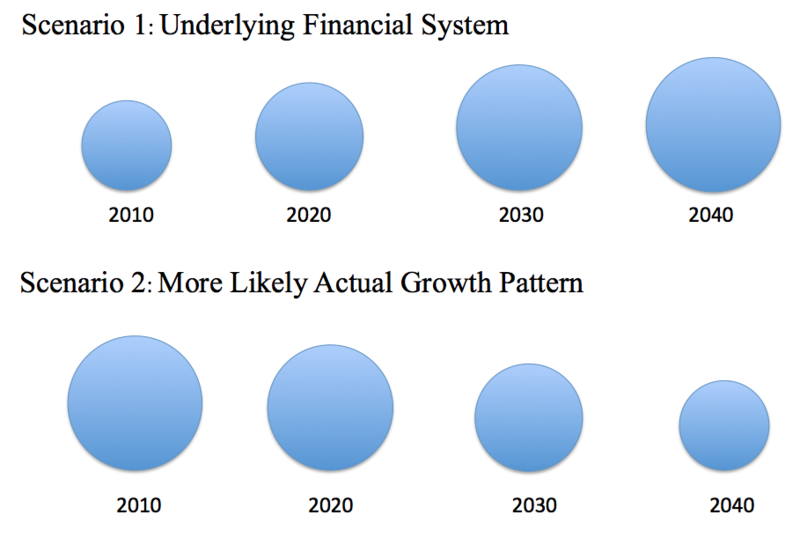 If we start reaching a situation where the future is no better than, or worse than, the present (Scenario 2 of Figure 4), then the existence of debt makes much less sense, because there are fewer investment opportunities, and because debt repayment is likely to be much more difficult. If we look at what has actually happened to the amount of US debt outstanding (Figure 5), loans in the private sector have fallen since the time oil prices hit their high in 2008, at the same time that governmental debt has risen. The rise in government debt has not been sufficient to keep total debt growing, however. Figure 5. US Domestic Debt, split between government debt (external only) and non-governmental debt. Based on Federal Reserve Z.1 data. Excludes Foreign Debt. There seems to be evidence that debt levels may fall further in the future. 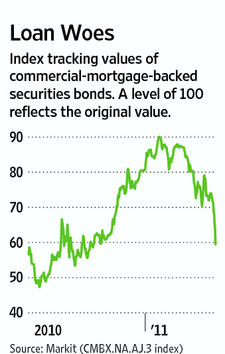 The Wall Street Journal recently showed this graph (Figure 6) showing that investors are now demanding higher yields to invest in commercial mortgage-backed securities. Figure 6. Wall Street Journal graph showing that investors are now demanding higher yields, in order to offer securitized mortgage-backed loans. Increasing debt is beneficial because it helps enable job growth and economic growth in general. For example, if a person takes out a car loan to buy a new car, this loan helps make possible the employment of people in the automobile manufacturing sector. Fewer loans lead to less building of new cars, and thus less employment, and less “economic growth,” as it is calculated in GDP. If individuals and businesses fail to take out additional new loans, and instead repay (or default on) old loans, the lower level of debt will further add to the drag on the economy that high oil prices provide. Thus debt deleveraging tends to add to the tendency toward recession. There are really two ways of slowing the economy–(1) high oil prices and (2) less debt availability. What seems to have happened in 2008 and may be happening now in 2011 is that there is a “hand-off” between the two. What seems to happen is that initially, oil prices rise in response to rising oil demand and limited supply. But in not too long, high oil prices start interfering with the credit market–causing more debt defaults, and causing lenders to become more cautious in making loans and buyers to be more cautious about buying big new purchases. If we look at US Consumer Credit Outstanding, we find that it peaked in the same month that oil prices hit their maximum, that is July 2008 (Figure 7). This interference with credit, and the resulting deleveraging, helped act to bring oil prices down, and continued the recession. Figure 7. 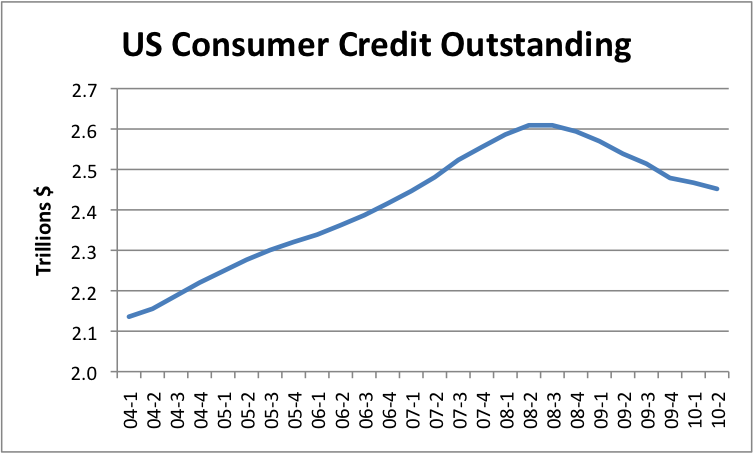 US Consumer Credit Outstanding, based on Federal Reserve Z.1 data. In 2008-2009, the recession was resolved when oil prices dropped low enough that the economy could start expanding at least a little. It is not clear to what extent this can happen in another recession. One issue of concern is that while we started with a great deal of cheap oil, the cheap oil has been mostly extracted. At some point, oil prices may become too high for people to afford, but too low to cover the costs of the companies extracting the oil. When this happens, we will have a real problem, because it will no longer make economic sense to continue extracting oil. Oil prices won’t be able to drop low enough, for long enough, to get us out of the recession. Now, in 2011, high oil prices and reduced reported economic growth make it look as though we are again bouncing against an economic growth ceiling caused by oil price limits. Prices seem to have reached a maximum in April or early May, and if the 2008 pattern repeats itself, we will soon be headed deep into recession. The debt deleveraging issue discussed above has the potential to be much worse this time around, now that governments have nearly reached the limit of debt they can take on. Governments are sufficiently in debt themselves that they find it difficult to add more debt. There may even be defaults on governmental debt in some parts of the world. The fact that economic growth rates seem to be down long-term may add further to deleveraging. We don’t know how all of these issues will play out, but between high oil prices and deleveraging, the evidence would seem to suggest the possibility of an even-worse recession in 2011-2012 than the last time around. This entry was posted in Financial Implications and tagged deleveraging, oil, oil price, recession. Bookmark the permalink. Gail, I’ve followed your articles in The Oil Drum for several years, and your idea that high oil prices are the main causal factor in triggering economic downturns/recessions in advanced industrialized countries has been a major recurring theme. However I remain unconvinced that you have proven your hypothesis. Your data shows the events to be strongly correlated, but we all know that correlation does not equal causation. Drawing plausible connections is the first step toward developing a theory, but plausibility is insufficient to determine the extent to which high oil prices are the main causal factor or the trigger event in economic contractions. I’d posit that Peak Oil is no longer a hypothesis, but rather data and proof a has advanced to the point where it should be considered a scientific fact. Your task is to bring the Peak Oil/recession hypothesis to the same level of confidence. In order to do so you will need to prove that the process of class stratification and income inequality that has been accelerating for the past three decades in the US is not a far more significant factor. If the theoretical structure is familiar that is because it has been around since the 1840’s. 1- Upper class uses its initially disproportionate resources to buy access to governmental power. 2- Uses political power to change taxation from highly progressive in the Eisenhower era to highly regressive under the Bush/Obama regime. Buys control of mainstream information/propaganda media. 3- Creates real estate bubble in order to sustain rising short-term middle class incomes while real wages from employment are falling. 4- Moves majority of industrial production overseas in search of low wage sweatshop conditions, decimating the manufacturing job market, leaving only construction for real estate speculation. 5- Turns the middle class real estate bubble into a banker’s Ponzi scheme based upon fraud overlooked by the bought-off political class and “Justice” department. Uses it to extract much of the remaining wealth held by the middle class. 6- Ponzi scheme collapses in 2008 as all of them do eventually. 7- Pumps 16 trillion dollars in loans and subsidies into a worldwide zombie banking system at the behest of the billionaires positioned to harvest the rewards, leaving no funding or political will for job creation in the Keynesian mode or large scale development of future energy sources. Which brings us to where we are today— on a parallel path to a second Greater Depression, with no cheap energy or non-nuclear war to bail capitalism out of the hole it has dug for itself. Are high oil prices a second level cause of the current economic collapse as I posit? If oil prices had remained stable would the process of class stratification have not led to similar results? What can you show me in the data to prove otherwise? Fossil fuel driven growth is what allowed the system you describe to develop. Oil, and the growth caused by oil, is what allows society become more than a society of subsistence farmers, with a few merchants, clergy, and a small political class. You have described a way we have managed to keep growth taking place, even as our share of the world’s energy resources stagnated. We found more low wage labor, and encouraged places such as China and India to support world growth by burning more coal–meanwhile patting ourselves on the backs for not being the ones raising CO2 emissions. I suppose I could write a post about how many of these things all fit together. These things aren’t possibly the cause of our current problems–they are other manifestations of the same problem that I have been describing. I have basically been saying the same thing for at least four years now, and what I have predicted has pretty much turned out to be true. An early post was in April 2007, called Our World Is Finite: Is this a Problem. I talk about severe recession being likely, among other things, and problems with the financial system. In January 2008, I pretty much forecast the things that would happen in 2008, in a post called Peak Oil and the Financial Markets: A Forecast for 2008. After what I said would happen, in fact happened, I wrote a post called Delusions of Finance. All of the things I say are very much related to the idea of Limits to Growth. It is very clear to me that we are running into limits, and this limits can be expected to cause problems of precisely the type we are having now. I suppose if it would make people understand things better, I could go back and explain how these other things fit in with the whole pattern. As we go forward, we can expect more and more Ponzi schemes to fall apart. It will be tempting to say that our problems are taking place because of the Social Security Ponzi scheme, or the banking Ponzi scheme, or the commercial real estate Ponzi scheme, or the stock market Ponzi scheme, but the issue is that what I am saying is fundamental. All of these things we take for granted no longer without growth. We can blame our problems on the bursting of these Ponzi schemes, but our real problems are the underlying ones, of running short of resources and too much pollution in a finite world.